Durable construction will stand up to the toughest use; 300 pound capacity sturdy shelves are textured for better grip and to minimize scratches. 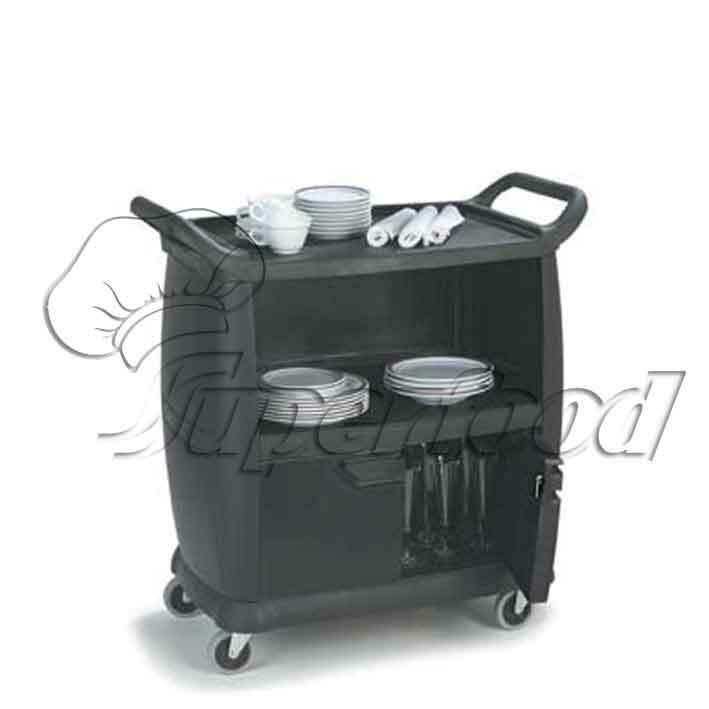 Use for front of house serving, bussing or even room service applications. Convenient knockdown design is easy to assemble. New large 106.68 cm x 58.42 cm cart reduces labor; two bus boxes will fit side by side on the shelves. Includes Carlisle’s standard 10.16 cm heavy-duty, non-marking swivel casters. Durable construction will stand up to the toughest use; 300 pound capacity sturdy shelves are textured for better grip and to minimize scratches. 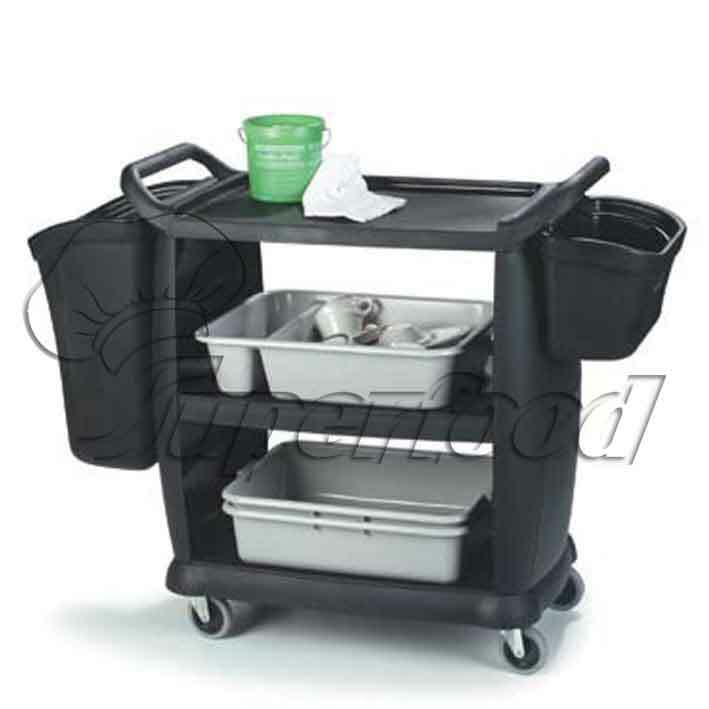 Use for front of house serving, bussing or even room service applications. Convenient knockdown design is easy to assemble. New large 91.44 cm x 45.72 cm cart reduces labor; two bus boxes will fit side by side on the shelves. Includes Carlisle’s standard 10.16 cm heavy-duty, non-marking swivel casters. Now available in standard or space saving model. Adjustable dividers eliminate the need for individually sized dollies. Dollies hold plates from 5‑1/2" to 12‑1/2". ADD6 & ADD8 also hold oval platters from 9‑1/2" x 7-1/4" to 13-1/2" x 10-1/2". Ergonomic rounded handles make it easier to push. 10" nonmarking wheels on one end make moving a loaded cart easy. Rounded corners won’t damage walls. Polyethylene dividers and walls help prevent dish edge chipping. NSF Listed; durable polyethylene construction. Two‑handed access to all plates reduces breakage. Additional dividers sold separately. 4 swivel (2 locking and 2 non-locking) standard Carlisle non-marking casters. Includes vinyl cover with easy-opening velcro side included for sanitary storage. Standard size holds 5 stacks of 9-7/8" to 11‑1/4" plates; 25% more than any other similar dish dolly; holds 8 stacks of 5-1/2" to 8-1/4" plates; 33-50% more than any other similar dish dolly (up to 50 or more plates per stack, depending on plate profile). Use 2 to 4 dividers for 10" or larger plates; 6 dividers for 8" to 9-3/4" plates; 8 dividers for 8 stacks of 7-3/4" or smaller plates; 2 dividers for 13-1/2" x 10-1/2" platters; 6 dividers for 9-1/2" x 7-1/4" to 12" x 9-1/4" platters. 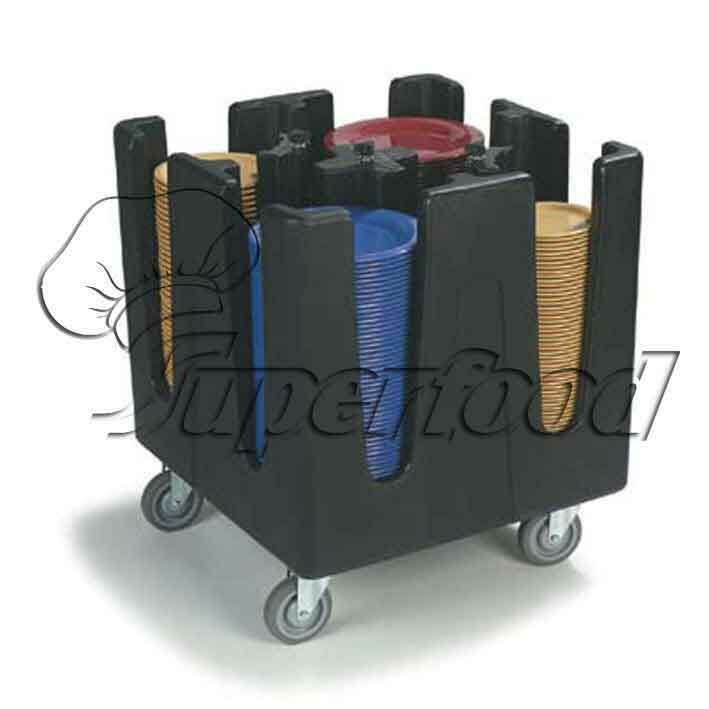 The most flexible dolly available; holds trays, plates, and platters. Smaller size fits through narrow corridors or under tables. Flexible configuration holds a huge variety of plates and platters. 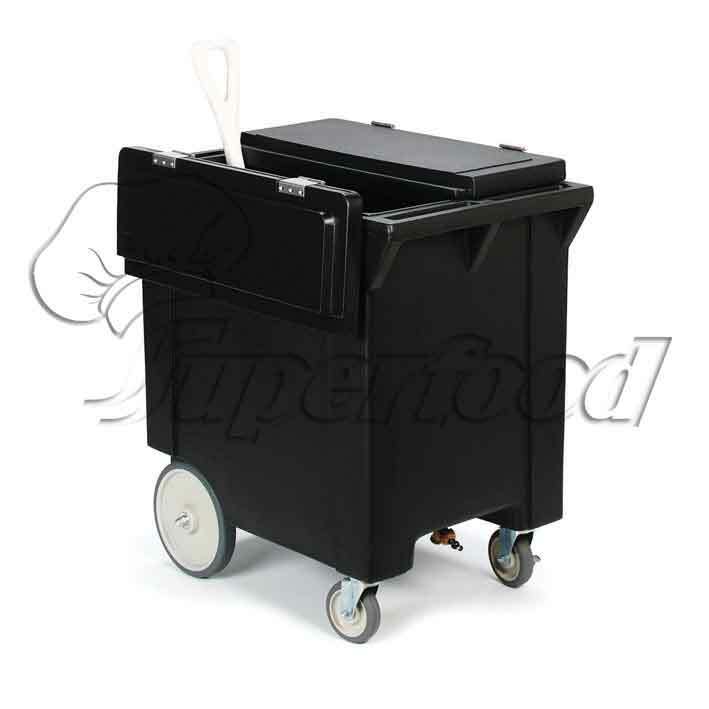 200 lb Ice Caddy offers extra large capacity within a compact space. Lid opens and lays flat against side of unit to conserve space. Front faucet for fast drainage and easy cleanup; inside has sloped base for complete drainage. Dual handles for easy maneuverability. 10" non-marking back wheels roll easily over rough surfaces. Includes convenient shelf; allows water to drain away from ice. 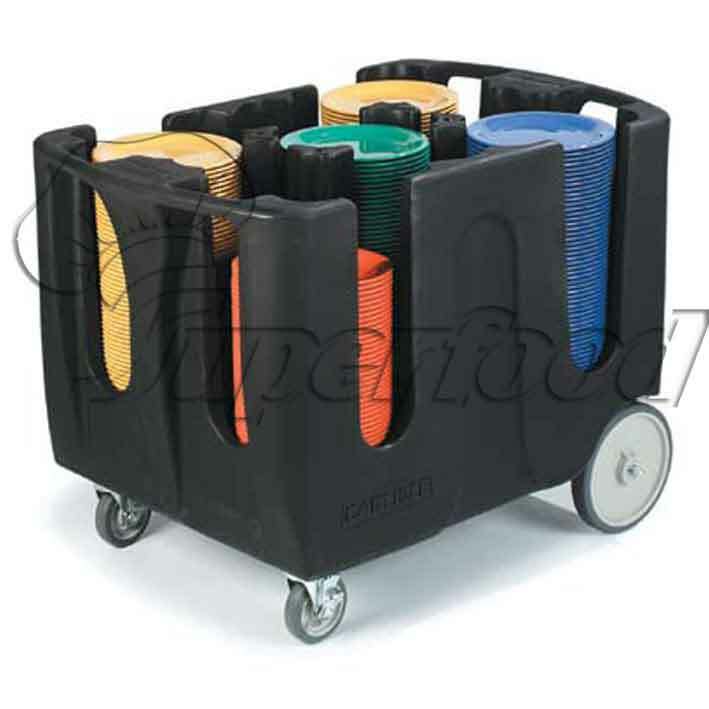 Rugged polypropylene cart resists cracking, peeling and corrosion. Three durable shelves with raised edges keep items organized and the 17" platform base holds a Bucket/Wringer or 23 gal TrimLine™ Waste Container. Comes with 25 gallon nylon bag for waste or laundry collection. 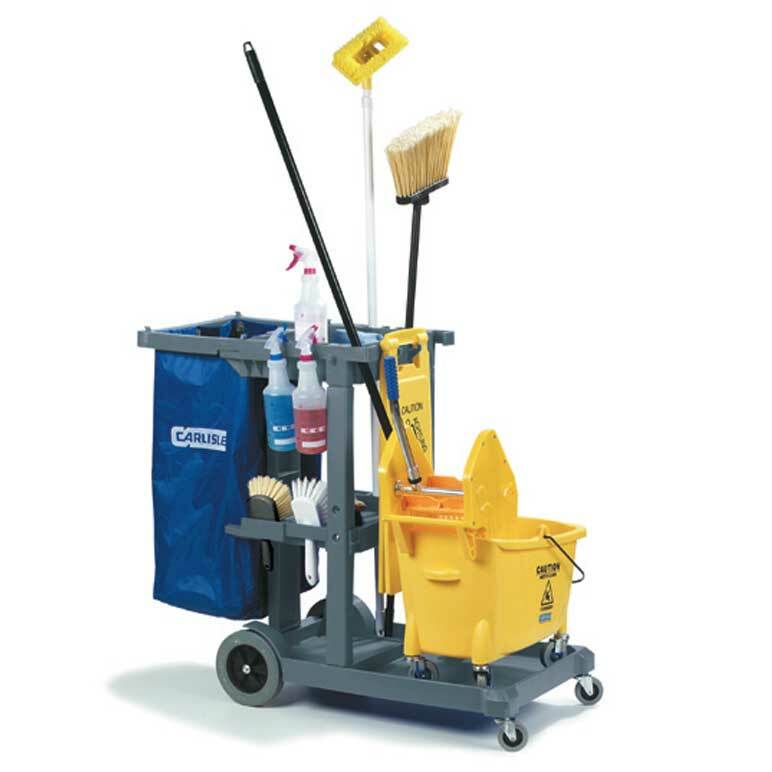 JC1945L has a 22" platform base that is great for holding large waste cans or up to two microfber buckets. 3" standard Carlisle non‑marking swivel casters in front. Large 8" non-marking rear wheels.